I love this painting. It sums up the Brighton I was born and grew up in. Holidaymakers only see (hopefully!) 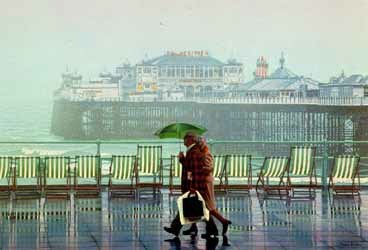 the sunny side of life down here, but us true Brightonians know the wet and windy side even better. And yes, I think he looks like Dennis Thatcher too. I now live in the States and my brother sent this print to me just so I wouldn’t forget the ‘lovely weather’! I have lived in Australia for nearly 40 years but have this printed on my wall to bring me happy memories of my home town.